The heart of Yangon is impressive Shwedagon Pagoda. Shwedagon Pagoda is the must-see place in a trip to Myanmar. The Pagoda is considered as one of the wonders of the religious world and the most revered site in this country. 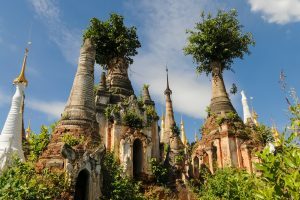 This is the 2500-year structure, which contains the relics of four Buddhas – the guardians of Yangon. Outside the Pagoda are hundreds of colorful shrines, pavilions, small stupas, Buddha images, and other objects of devotion. Pilgrims walk clockwise, around the main Pagoda, as is tradition, before stopping in one of the pavilions to prayer, meditate or simply contemplate. 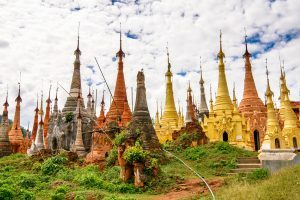 No building dares to be higher than the ancient stupa tower Golden Spire of Shwadagon Pagoda, which is almost 100 meters high and visible from miles away. Its complex structure is plated in gold; the upper dome is studded with more than 5,000 diamonds and precious gems. There is also a single 76-carat diamond at the tip of the stupa. 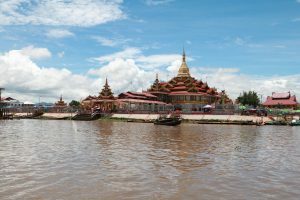 A trip to Yangon cannot be completed without Shwedagon Pagoda, the most magnificent and sacred site of the country as well as Southeast Asia. Opening Hours: Daily from 04:00 to 22:00; Last admission is at 21:45 Location: Shwedagon is located north of central Yangon, between the People’s Park and Kandawgyi Lake.